If you were to visit Lowell, Massachusetts before . . . say, 1890, you would not have met many men walking about the city named João or Manuel. The Portuguese began arriving en masse in New England in the late 19th century and had established, by the first decades of the 20th century, sizable communities in Rhode Island and Massachusetts. Most of these Portuguese hailed Madeira or the Azores, island possessions of mainland Portugal. 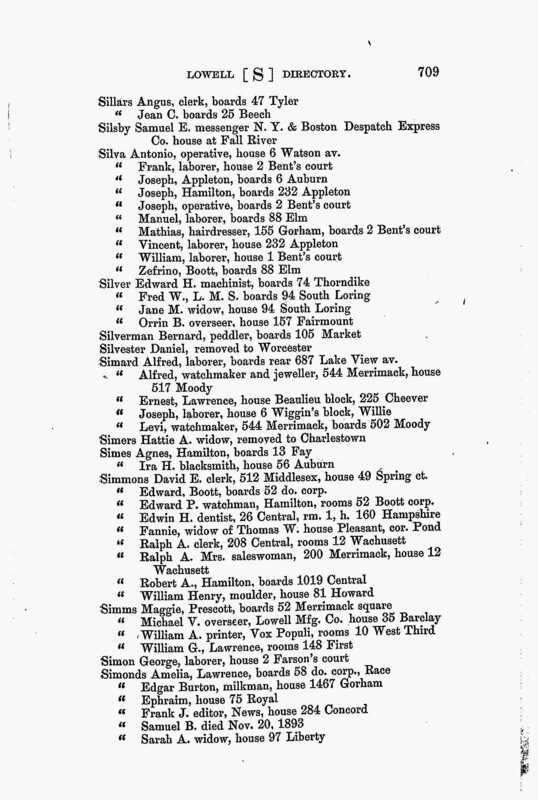 The three pages attached below are taken from the Lowell, Massachusetts City Directories for 1884, 1894, and 1910. The surname Silva, one of the most common Portuguese surnames, does not appear at all in the 1884 directory. 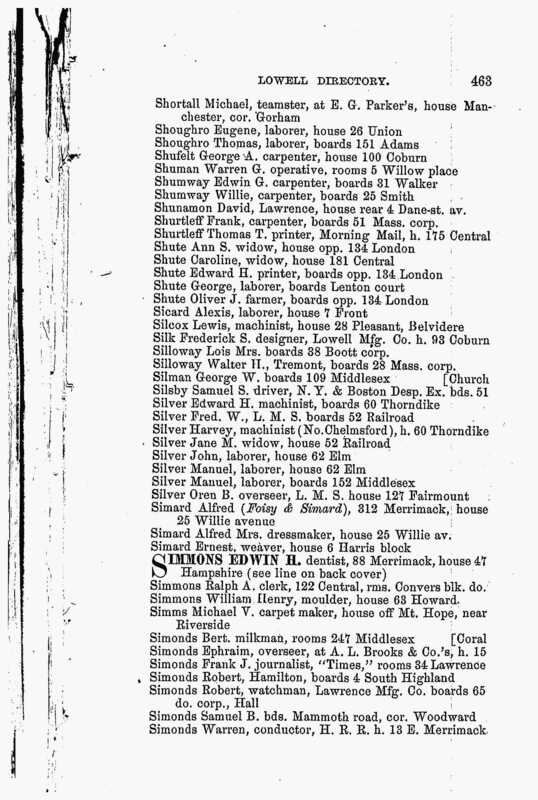 Just ten years later, in 1894, ten Silva men are listed in the Directory. And, by 1910, this number had grown to 42 individuals with the surname Silva. If you’re among the roughly 1 in 20 Americans who today claim Portuguese ancestry, you’ve likely discovered that Portuguese genealogy presents some challenges. Records are not as widely available as they are for other Western European countries, and often are not translated from Portuguese. Additionally, vital records (birth/baptism, marriage, death) are frequently church records whose form and content vary widely depending on the time and region of the record. As an added challenge, many Portuguese arriving in the United States during the late 19th and early 20th centuries changed their names either to appear more American or so others would be more able to pronounce their names. In my own research, I’ve found Machados who became Marshalls and Pereiras who became Perrys. To add to the challenge, first names are often translated too. José becomes Joe and João becomes John. 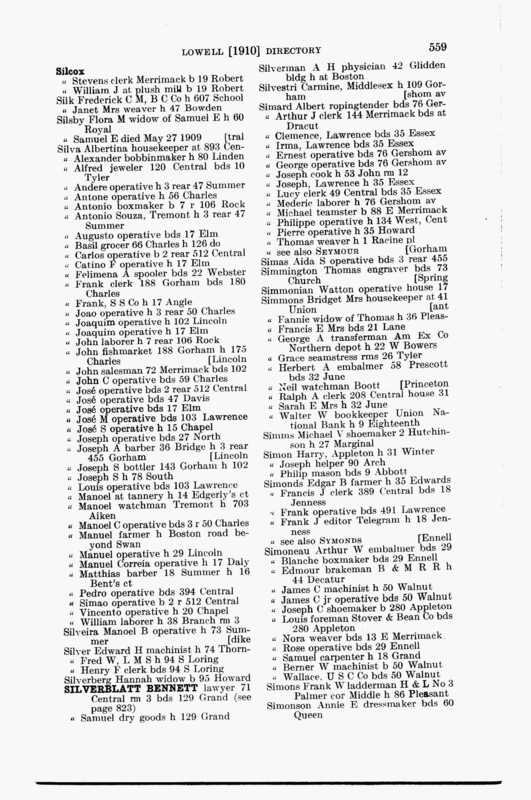 There’s some evidence of this in the Lowell City Directory listings above, where many of the Silvas use Anglicized names like Joseph, Frank, John, and Louis. 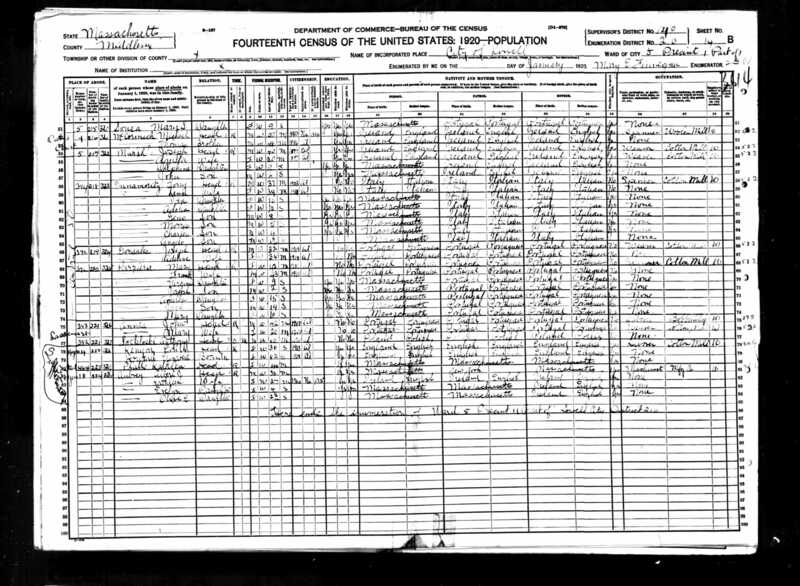 It took me what felt like forever to find my grandmother’s Machado family in the 1920 U.S. census and with good reason. When I finally found them, they were listed as an Irish family with the surname “Marsh” (Below, see lines 54-57.) Sometimes, the errors recorded in census records tell you more than the true information that was recorded. From this record, I can get an idea of how my great-grandfather’s pronunciation of “Machado” sounded to a native English speaker from Massachusetts. How she ever ended up listing them as English speakers from Ireland though, I’ll never know. They were light-skinned Portuguese folks with light eyes, but likely spoke broken English at the time. Admittedly, the challenges of Portuguese genealogy are many, but the Portuguese people have a rich history. Who wouldn’t want to learn more about one’s ties to a culture that gave us some of the world’s great explorers, e.g., Henry the Navigator, Vasco da Gama, Ferdinand Magellan, as well as fellow present-day descendants like Tom Hanks and Meredith Vieira? The Portuguese even had their own crazy set of royals (which they overthrew during the Revolution of 1910). And Portuguese history is full of interesting stories that are not well-known in the English-speaking world. Perhaps one of the most curious tales to have occurred during the nearly eight-century history of the Portuguese monarchy is that of the legend of Pedro I. The legends goes that Pedro I was so distraught that his wife, Inês de Castro, had died before he became King that, when he eventually ascended the throne in 1357, he exhumed her body, put her upon the throne, bejeweled and dressed in a rich gown, and then required each of his new vassals to kiss her hand as a show of fealty to their new queen. When I first started researching my grandfather’s family, I vaguely knew that he had come from Madeira, a Portuguese island about 600 miles from mainland Portugal and 400 miles from Morocco that had first been settled by the Portuguese about a decade after Henry the Navigator had sponsored a voyage there in 1419. When I later read his obituary, it rekindled a memory that he had been born in its capital city of Funchal. I also knew his parents names had been John and Frances. With his birthdate, it was a good start. While genealogy records seem to abound for ancestors from the British Isles, Portugal’s ancestral records are relatively unexplored. Even a few years later I started researching, online resources were still fairly limited. There were a few people in Portugal willing to help out through the internet, but with the foreign currency issue (how to pay them), and the vague unease associated with internet transactions, it seemed more trouble than it was worth. I tabled further research for a while, content to know that my ancestors came from Madeira, from its capital city Funchal – until I was fortunate enough to land a temporary work assignment in Portugal’s capital city, Lisbon. In April 2004, I arrived in Lisbon to work the assignment, and to perfect the Portuguese I had been learning in Brazil. Three things about Portugal: 1. the Portuguese of Lisbon is very distinct from the Portuguese of Brazil; it varies verbally and grammatically to a greater extent than American English differs from British English. 2. the Portuguese of Madeira sounds a lot different from the Portuguese of Lisbon. 3. Madeira is an autonomous region of Portugal and is considered somewhat separate, both culturally and geographically, from mainland Portugal. Even from Lisbon, Funchal is still a two-hour flight. But, by 2004, Portugal had begun to put some of its genealogical information online. Already armed with my grandfather’s date of birth and his birth city, I requested his birth record from the government-run website. A few weeks later, the baptismal record arrived. And, as I opened it, I thought ‘what luck!’ The certificate included not only details around his birth, but also details about his parents and even grandparents. And, it showed that my family had come from an even smaller village on Madeira a generation earlier, called Caniςo. At this point, the website and its indexes are only available in Portuguese, but with the knowledge of a few terms, you should be able to navigate the website quite easily. From the homepage above, click on “bases de dados”. For marriages, search “casamentos”. Baptisms and Passports are the next two links in Portuguese words that will look familiar to English speakers. I still stare sometimes at the earliest names on that list. When I look at the earliest, a direct ancestor who was born in 1535, I wonder what his life was like all those years ago on Madeira, and just how many descendants he has in New England, the United States, and in the many other regions of the world. In years, 475 are a lot. I don’t have his date of death (those seem to be less consistently recorded than dates of baptisms and marriages), but it’s probably a safe bet that he had long since passed away before the Pilgrims first stepped on Plymouth Rock in 1620. I didn’t realize before now that there were so many immigrants from Portugal in Massachusetts… the only native of MA of Portugese descent I could think of was Emeril Lagasse (half Portugese, half French Canadian). Also didn’t realize that Portugese records were so difficult to come by… many of the issues you mention are also issues with Eastern European and Jewish ancestry (my grandfather was a Russian Jew)– bad record keeping (sometimes intentionally, due to anti-Semitism), changes of name spellings and often the whole names themselves, etc. How fortunate you were to be able to go back so far on your Portugese line! Thank you for this article. Congratulations on finding so much information on your family. It is definitely a challenge to find Portuguese records. We too are of Portuguese descendents and have hit many roadblocks. As far as I know our family originates from the mainland. We too have Machado’s in our family on my fathers side. Thanks again for your story and also for some of the tips on where to go. I have a book containing the history of most Portuguese surnames and can look up yours, if you like. Good luck! Hello. My name is Richard. My grandfather has portuguese ancestry that I am trying to research. His family moved from portugal to the azores to portsmouth, Rhode Island. In two generations. For his parents last name I have written digais, dagais, diagais and variations thereof. For his grandparents I have written godais or goodis (maybe its supposed to be the same name!). I know some of their middle names can also be last names. Their middle names, however, are more relate-able to real last names. The above names are mispelled I am guessing. I hope you can help me look up what the correct name is supposed to be in your book of surnames! I just cant seem to find a place to start.. have always wanted to find information in regards to my Portuguese roots. My grt grt grand father is know by Juan/Guan Fido from Portugal.. he immigrated to the Pacific Islands hes name was changed to John Fidow. “Fido” is his last name and he married a Samoan lady during the early 1800s.. would anyone have any idea please? thanks! First, look for Joao (with tilda over the last two, not Juan which is Spanish.) Guan, AFAICT never existed. Fidow? could be anything from Figo to Fino? Fido doesn’t actually exist as a surname. I’m born and raised in Portugal, born 1962, lived there till 22. current name citizenship + married name. Birth name Alice Maria da Silva Marques de Almeida. I have been researching my genealogy over the lat few years, discovering a direct link to John Howland of the Mayflower. However, the other half of my lineage is Portuguese. I am from Lowell, MA, and my maiden name was Garcia. I am told that it was changed from the original surname “Garcez” when my great grandfather and his wife emigrated from the Azores. In addition, my Howland line includes a “Marshall,” whom I am told was from Portuguese descent. Up until now, I thought that there was no hope for researching that part of my genealogy, but you have given me renewed interest! Hi Kelly – Glad you enjoyed the article, and good luck! I too have Portuguese “Marshalls” in my tree. Their original surname was Machado. Wow! Ok, this is very good to know. I’m also from Boston, MA…My Dad’s side is the Portuguese/French Canadian & Mom’s is Irish/German/French. Her side is easier while getting the information from Dad’s is more difficult as he was an only child though the family was quite large out of E. Boston & Somerville, as I understand. Grammy passed way back in 1990. He did mention a cousin who used to go back to Portugal but honestly, I don’t get why the families aren’t always openly sharing more information. I desperately want to learn more & maybe return to Portugal. I´m Portuguese and we have 2 offices in Portugal dedicated exclusive to genealogical investigation, if we can be of any help and if don´t mind i will leave our contacts bellow, one in Portuguese and one in English. I just started to research my husband’s maternal grandmother who he always knew as Betty and she was born in Honolulu, Hawaii. Fortunately, I just received a copy of her baptismal record to find out that she was baptized as Jacintha Botelho. I now have both her mother (Marianna) and father’s (Antonio) name but have hit a roadblock. Both were from Portugal and I did find on Ancestry.com an Antonio Botelho and Anna Jesus who arrived in Honolulu from Portugal in 1906 but I can’t find anything else. Any help is appreciated. Hello Deb, Portuguese genealogy can be challenging, especially with the naming conventions of the Portuguese – there’s not a lot of variety in names, and it’s easy to confuse two different people with similar names. I’ve had good luck researching records from Portugal. If you know where your ancestors are from in Portugal, you might have some luck finding their Portuguese passport application, or baptismal/marriage records. The Azores and Madeira island both have considerable online resources, if your ancestors came from the islands. Good luck! Try Ferreira instead of Ferrier. Family name for us too. This was an interesting article. My grandmother was Portuguese but her family migrated to Maui. Her surname was Correa and there are literally thousands of Correas in the Hawaiian Islands, so this is going to extremely difficult. I hope one day I can find more information about her family. My friend Larry Correia is a well-known author in the US. He’s also a Mormon, which means he might have made some headway in this. You might consider a ping and maybe he can point you somewhere. There are literally thousands of Correia families in Portugal too, so it’s going to be difficult. I am in Fall River Massachusetts and trying to research my Azorean roots in St. Michaels. My grandfather Manuel Raposa, aka Manuel Patrao was from Arriffes, my grandmother, Isabel Botelho (Mello), from Santa Antonio. I tried the English link you listed but received the message that the server could not be found. I’m trying to get their birth certificates. Could you point me in a direction? Would that be from church in their villages and if so, can those be obtained via the internet? I researching my family tree I found this site. I almost fell out of my chair when I read your family was from Caniço. My material side of the family is also from Caniço and immigrated to Lowell, Massachusetts. You mentioned finding someone with family from Caniço who tranced their line back to the 1500ºs. I was hoping you might share where I can locate that information. Feel free to send me a private message if you prefer. I have the maternal side tranced back to the early 1800ºs, but would love to go back further. Thank you in advance for any assistance you can provide. It’s set to pull 1905 records, but you can change the year to pull other records. Good luck!